At his restaurant Underbelly, Houston chef Chris Shepherd (a 2013 F&W Best New Chef) is big into fermentation, pickling and curing. His pickled strawberries are both surprising and really delicious. At his restaurant Underbelly, Houston chef Chris Shepherd (a 2013 F&W Best New Chef) is big into fermentation, brining, pickling and curing, to the point where a chemistry professor from Rice University is now a regular adjunct to his kitchen team. 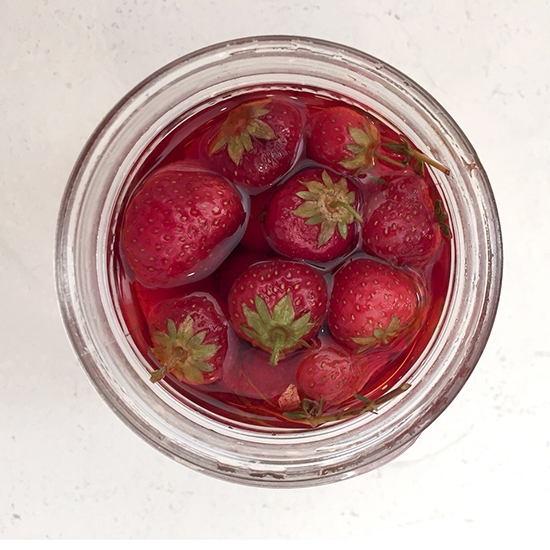 This fascination manifests in all sorts of ways on Underbelly’s menu, but on one trip there, I found what I’ve decided is my new favorite summer snack: pickled strawberries. Conveniently, Shepherd turned up at the F&W offices the other day, so I cornered him and asked for the recipe. Nice guy that he is, he said, “Sure.” And note that while a pickled strawberry may sound weird, the sweet-sour combination of flavors actually tastes great, especially with ripe, local strawberries and some herbs tossed into the brine. Shepherd uses them as garnish for various dishes; I think they’re also great by themselves, in a bowl. His recipe suggests using fresh thyme, but the variations are effectively endless. As Shepherd said when I asked him, “Oh sure—you can sub in a dried chile for the thyme. Or do both. Or, you know, use rice vinegar and cut the sugar back. Or sherry vinegar. Or use honey instead of sugar, or sorghum instead of sugar, or use other dried herbs, and peppers, or not peppers, or really anything. We also do this with tomatoes instead of strawberries. Little tiny super-ripe tomatoes, those are great. You blanch and peel them, pickle them, then make a bunch of thick ham-hock gravy and broil the gravy with Mornay sauce on it, then put the tomatoes on top of that. Or…” I stopped him there, before things got too crazy. In a 12-oz. heatproof glass jar, stir the sugar and salt with the hot water until dissolved. Add the cider vinegar and let cool to room temperature. Stir in the strawberries and add the thyme sprigs; the strawberries should be covered by the brine. Cover and let stand for at least 20 minutes and up to 1 day in the refrigerator.